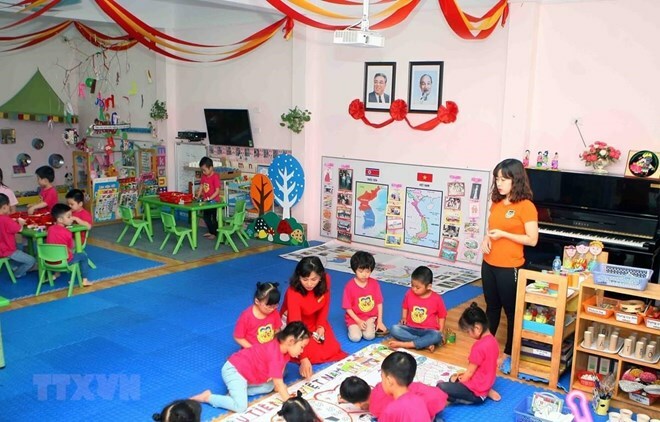 Hanoi (VNA) – An exchange programme between the Democratic People’s Republic of Korea (DPRK)’s Kieng San Talent Kindergarten and the Vietnam-DPRK Friendship Kindergarten was held in Hanoi on March 27. The event was jointly held by the Vietnam-DPRK Friendship Association and Vietnam-DPRK Friendship Kindergarten to celebrate the success of the official friendship visit to Vietnam by Chairman of the Workers’ Party and the State Affairs Commission of the DPRK Kim Jong-un in late February and early March. It took place within the framework of a working visit to Vietnam of the DPRK-Vietnam Friendship Association delegation, led by its Vice President Ri Kang-juk, who is also Principal of Kieng San Talent Kindergarten. Speaking at the event, Principal of Vietnam-DPRK Friendship Kindergarten Ngo Thi Minh Ha said that the kindergarten was presented as a gift by the DPRK to Vietnam on March 8, 1978. Over the past 41 years, the kindergarten has organised many activities to contribute to the bilateral traditional relations, thus becoming a symbol of the two peoples’ friendship. The kindergarten now has 17 classes with 470 students, Ha stated. Ri Kang-juk said that the DPRK-Vietnam friendship, nurtured by DPRK Chairman Kim Il-sung, Vietnamese President Ho Chi Minh, and generations of the two countries’ leaders, has been lifted to a new height after the Vietnam visit by DPRK leader Kim Jong-un. She affirmed that Kieng San Talent Kindergarten’s staff will do their utmost to boost the bilateral relations.